It's a trek up narrow stairs to the attic of the Columbia County Courthouse, where Andy Ventris gives a hard crank to a lever, then winds it several times. "They'll be thankful I did this," he says, pulling down a set of stairs to ascend further up the building. 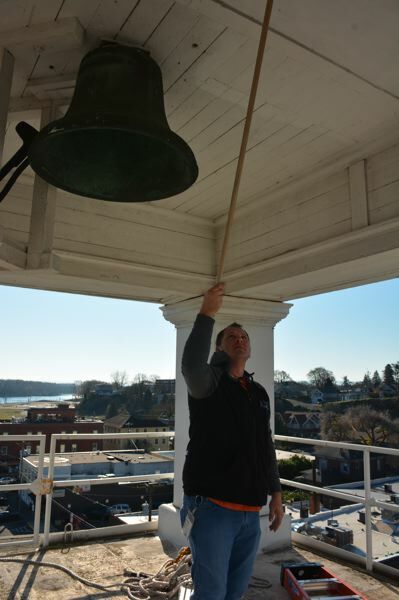 At the top of the courthouse, wind whips through a small platform, where the courthouse's clock tower and brass bell sits, giving a bird's eye view of the Columbia River and rooftops in St. Helens. At noon, the bell rings several times, sending out chimes heard throughout the courthouse plaza. The clock tower and bell are benchmarks of the historic courthouse building, but unlike the smart phones and watches used by visitors to the courthouse, the bell and clock features still require manual winding every few days. Ventris is one of a few Columbia County facilities employees tasked with climbing up the old courthouse's entryways and winding the clock each week. The resounding chimes are nostalgic, charming and, at times, disquieting, but they don't always ring exactly on the hour, and at times over the past several decades, the clock didn't work at all, says Stephen Topaz of St. Helens. Topaz was part of an effort years ago by St. Helens Economic Development Corp. to get the clock tower repaired. Since then, he's become a de facto historian and caretaker of the contraption. "When I was with SHEDCO we were thinking of things to do," Topaz recalls. "Someone said it would be nice if we could get the clock to work." He produces copies of the original purchase receipt from 1910 for the Seth Thomas clock — the same maker who produced the historic clock in Portland's Union Station. "The bell had to be heard from five miles away," Topaz says "and they paid an extra $200 to have a gadget on the clock that would light the lights on the clock in the dark." The clock and bell rely on a weighted pulley system, with several gears and teeth in place from the base of the clock to the bell at the top. When Topaz was first taken up to the clock tower by a county maintenance worker, he says the contraption laid in disrepair for years because of a few loose screws. "Each of those turns has some mechanism," he notes. "The one on top of the northwest column, the two screws had dropped off and we put in two screws and tightened it up and got it to work." The clock tower is rumored to have served as a hiding place for a courthouse custodian from decades past, seeking solitude. "There were old whisky bottles up there," Topaz claims. There were other issues. Over the years, the clock has fallen victim to neglect, bird droppings and random mishaps, according to Topaz. "Once upon a time the Christmas lights fell off the building and got tangled in the clock," he says. The St. Helens man, who also happens to be a newly elected city councilor, says one of the clock faces that was originally painted contained only 57 tick marks, so the clock faces were re-painted. Despite the SHEDCO project to repair the clock tower, it remains a burdensome tinker toy. "Throughout the decades, it went for some long periods of not working," says Casey Garrett, facilities director for Columbia County. Garrett says even with constant winding, "there's other gears and teeth that work the mechanism, and it's just a constant struggle to keep it working." Even today, Topaz says it's a remarkable feat to get the clock working within a minute of the correct time. Both Topaz and Garrett say winds cause the clock tower's weighted system to sway, which is a problem all in its own. Years ago, the county had hoped for a state grant to repair portions of the clock tower at the old courthouse, but funding for courthouse improvements has since dried up at the state level, Garrett says. He says county leaders are hoping to find future funding for the clock tower. In the meantime, the bell continues to ring, with the help of behind-the-scenes labor. "There's a lot of nostalgia about it," Topaz says. "A lot of people really love the sound."